Contents: Pizza, corn, lowfat milk and half an orange. Notes: I'd like to note that this is the 3rd lunch I've seen pairing corn and pizza. 1st and 2nd. I don't know where the school lunch program got the idea that sweet corn was the proper side dish for pizza, but I always got that when I was a kid too. Oh, I still remember the vaguely cube-like "pepperoni" of our school lunch pizzas. Not fondly, either! 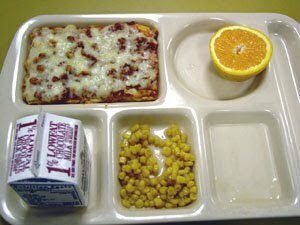 Yes, cracker-style pizza and heated frozen corn were a staple of my elementary school in Michigan. But I can't say it got any healthier in middle school when they switched from creepy faux-pizza to Dominos. I also remember corn as the accompaniment to burgers. Perhaps it had more to do with the corn being cheap than the idea that it was good pairing. We ALWAYS have corn with pizza. As a student, and every school ive taught at. Wonder why? I always thought pizza and corn was a strange combination. Call me crazy, but I always (and still do) LOVE the combination of pizza and corn. I also loved the rectangular school pizza, I thought it was great. Again, call me crazy!